Family Man - Notes: 270-279. This seems intense to contemporary Westerners, but in many traditional societies, girls are married not necessarily when they’re sexually mature adult women ready to start an independent family and run its affairs, but when they’re old enough to leave home and begin their domestic apprenticeship under the strict authority of her experienced mother-in-law. Traditional Romani society typically takes matriarchal authority very seriously, and getting a late start on matchmaking could result in your daughter eloping with a boyfriend, instead of a husband carefully selected for his personal and familial advantages. Marriages-by-elopement would often be recognized and accepted, but definitely not preferred. And, as in all societies, it’s best to send your daughter to live with a family that displays prosperity and virtue – which for this culture would include fierce resistance to forced settlement and assimilation. 271. More about ritual purity and impurity in some traditional Romani groups (not all, since there’s a great deal of diversity of belief in worldwide Rom culture): much of the recorded purity law has to do with quarantining the influence of female reproductive power. For this particular subgroup, women’s bodies below the waist are incredibly powerful at all times, not just during menstruation or after birth – as previously mentioned, a man who brushes up against a woman’s skirts would be rendered ritually unclean. This extends beyond direct contact. A man could be soiled by walking on the ground floor of a building underneath the spot where a woman is standing on the second storey. The prospect of settling in such a building, as outsiders do, would be skin-crawlingly offensive on many levels. Also referenced in this page: when families were forced into settlement in this region and era, their children would often be removed from their care and raised by local Christian families. This brute-force assimilation technique bears some resemblance to the cultural tactics of the American Indian boarding schools that plagued the USA until the early 20th century. 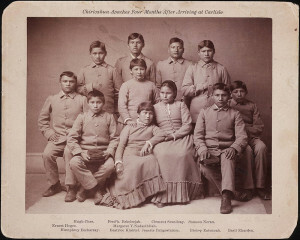 “Assimilated” Apache children at boarding school. 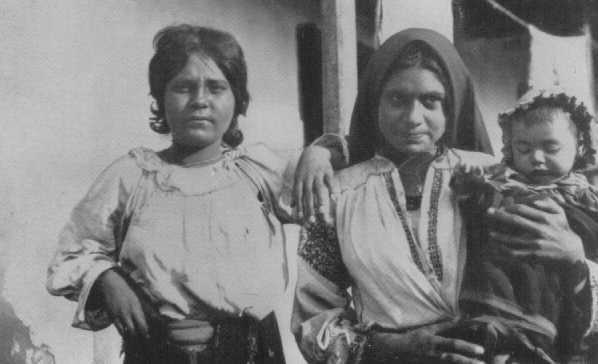 As for gender power relations in marriage, many Romani groups are patriarchal on first glance, but like several other nominally patriarchal societies, a great deal of power is imputed to women in domains less visible to the outside observer. Men might be accorded power over external affairs like travel routes, relations with non-Romani, and meta-politics with other families, while women dictated virtually all the details of daily life, child-rearing, and household economics. You can find infinitely more and better sociological information at http://rombase.uni-graz.at/. 272. The old route: as you might expect from a migratory society, “the road” or “the route” “the journey” or “the way” is a multifaceted and very important concept. In Romani sources I generally see that concept called “drom,” from the similar-meaning Greek word “dromos” (δρομοσ). 273. “You’ll be the death of me” – the implication is that he’ll be accused of being a horse thief, which is a pretty reasonable bet. Externally imposed poverty, a cultural disinterest in the fussy legalities of Western-style property ownership, and an occasional attitude of “all’s fair” gamesmanship in regards to getting whatever you can from dense, foolish, rich outsiders, has caused a lot of historic strife between Romani groups and Westerners. The resulting stereotype has frequently devolved into a vicious cycle of scapegoating. 274. As for Ariana, she was going to leave Luther a “Dear John” note, and then didn’t – but still took the book off the shelf, so now Luther’s waiting for his date, like a chump. It’s the 18th century equivalent of dumping somebody by not answering their texts. And here’s at least one other person who thinks Ariana dressing up this way isn’t particularly startling. 276. …use the money to buy winter supplies off the books. Or at least that’s what Ariana says is happening. 277. Wolves don’t typically eat other wolves (which is good practice, since pathogens and parasites that impact wolves are more likely to be found in, you guessed it, the bodies of other wolves), but if prey is in short supply, and the wolf isn’t from their own pack, they’re much more likely to indulge. Lemme tell you, listening to a bunch of audio files of wolves snarling in order to get the sound effect right is a weirdly stressful experience. That sound has some primal “this is bad, run away” programming. Which apparently Kamilla lacks. 278. Alesh’s unnamed mate is a recent acquisition. Only Emil, the youngest (Agata’s wolf), is her own offspring. She probably would’ve killed Alesh’s two offspring from his previous mate (Bela and Jan) on arrival had they been any younger. The beat-up, submissive scapegoat wolf is Alesh’s unfortunate littermate. None of this is really plot-critical at the moment, but I had fun coming up with Wolf Drama. Now you know for sure where everybody gets their wolf furs from; deceased members of the pack are skinned and the hide is cured, probably by brain tanning. Milena and Agata don’t have to sleep in the second den all the time, it seems.